In the City of London there is the greatest concentration of church buildings of outstanding quality anywhere in the country. Today there are no fewer than 42 places of worship situated within the Square Mile, all of which are either Grade I or Grade II* listed. Of course there were once many more churches in the City. After the great rebuilding programme following the disastrous Great Fire of London in 1666, the Square Mile had about 75 churches. Over the centuries, as people slowly moved out of the City, the number of regular worshippers began to decline, with the result that by the 19th Century a number of churches were closed and pulled down. By 1910 the number of Anglican churches in the City had fallen to 56; by 1939 that number had reduced to 49. During the blitz of the Second World War a further 23 churches were badly damaged or destroyed, with five totally written off. Remarkably, a trace of these recently lost churches can still be seen in some solitary standing towers and beautifully landscaped gardens nestled within the remains of their ruined walls. By the late 1960s there were 39 Anglican churches in very good condition — due to the efforts of restoration or rebuilding. Despite this it was becoming clear that many of the City's churches had effectively become redundant. What to do? Over the last hundred years there have been at least six specially commissioned reports into the matter. The latest of these was commissioned from Lord Templeman by the then Bishop of London and was published in January 1994. The report recommended that the number of active Anglican City churches should be reduced to twelve and overall there should be three categories: 'parish churches' (designate four in number); 'active non-parish churches' (designate eight); with the remainder being 'reserve churches' (27). It was suggested that this latter group — essentially made up of redundant churches — could be used for cultural or educational purposes. The proposals of the 1994 Templeman Commission prompted Marcus Binney, of the SAVE Britain's Heritage organisation, to talk with The Friends of Friendless Churches, who had under its wing a charity called The Friends of the City Churches. The Friends had been set up after the Second World War when the rebuilding and restoration of some City churches seemed to be in doubt. After its early post-war successes, though, the charity had effectively became moribund. With modern concerns over church redundancy, and through Binney's initiative, The Friends of the City Churches' became reborn! The 'new' Friends of the City Churches came into being in 1994, bringing together many people who cared for and valued the City's churches, with the aim of ensuring that the churches would be preserved intact for posterity and, most importantly, be kept open to visitors on a regular basis. The Friend's growing campaign made sure that the more drastic proposals of the Templeman Commission were never implemented. This campaign was greatly helped by the late Reverend John Paul, then vicar of St Andrew by the Wardrobe. It was John who organised a conference in November 1994 at London's Guildhall with the optimistic title of A More Excellent Way, that was in essence a detailed and well-argued submission for the future of the City Churches. It made clear that mothballing the churches was simply not acceptable and highlighted a number of people keen to keep the threatened churches open. Thus the Friends began their endeavour to keep the City's churches open. Regular opening of threatened churches to visitors would be possible provided that responsible and reliable persons could be found to watch over them at least one day a week. Contact was made with Melba Coombs of NADFAS (National Association of Decorative and Fine Arts Societies), who joined The Friends to organise its 'watchers' service. The first church watching began at St Sepulchre without Newgate, shortly followed by St Mary Aldermary. 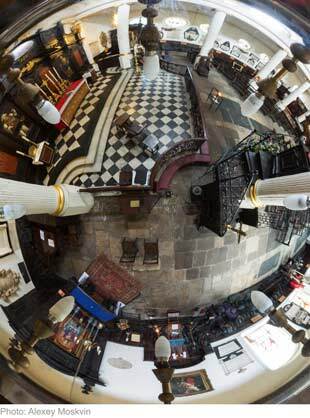 Today over 100 Watchers oversee the openings of 17 City of London churches. In January 1996 Richard Chartres — who had avowed to keep the City churches functioning as places open on a regular basis — was installed as Lord Bishop of London. His appointment gave new heart to the efforts of The Friends of the City Churches and it is appropriate that Bishop Richard became Patron of the charity. The Friends of the City Churches has gone from strength to strength and now has over 1200 members from all over the world. The Friends are always keen to expand their membership to people of like mind — who wish to preserve the priceless heritage enshrined in our unique collection of churches in the City of London. On 14 May 2013 The Friends moved from St Magnus the Martyr to its new headquarters at St Mary Abchurch. View some of the excitement on that quarter's blog page.